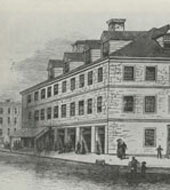 Henry Fite’s house in Baltimore, known later as Congress Hall. We already know of the first two capitals since the Constitution was ratified: New York and Philadelphia. But how about York, Lancaster, or Baltimore before that? These former capitals are as fleeting in American memory as they were temporary. Basically, the early U.S. capitals were wherever Congress hung its hat. And although the Second Continental Congress started out in Philadelphia, it soon hit the road after declaring independence. With British troops nipping at its heels, Congress left Philadelphia in December 1776 and headed to Baltimore, Maryland, convening in the rather roomy house of one Henry Fite. Once things improved on the battlefield, Congress returned to Philadelphia, but it was soon on the move throughout Pennsylvania, off to Lancaster (admittedly just for one day), York, and then finally back to Philadelphia. After the war ended, the Congress under the Articles of Confederation fled Philadelphia once more – but this time from American troops during the Pennsylvania Mutiny of 1783. During this period we racked up even more capitals – Princeton, Annapolis, Trenton – and finally, the first official capital of the newly constituted United States: New York. Add in one more (and hopefully permanent) capital – the District of Columbia – and that makes a grand total of nine capitals. And, seriously, isn’t there a U.S. Capitol story with Havre de Grace on the MD/PA line? Some sort of DC specific history there? There were actually a dizzying number of cities and locations that were bandied about as possible capitals instead of D.C. – even suggestions of having two capitals at once.